As Russia begins the annex of Crimea, Israel closes all of its foreign embassies around the world – for the first time ever – (http://www.reuters.com/article/2014/03/23/us-israel-diplomacy-idUSBREA2M0ER20140323?feedType=RSS), Turkey shoots down a Syrian plane overnight (http://www.smh.com.au/world/turkey-shoots-down-syrian-plane-20140324-hvlzy.html) and the mystery of missing flight MH370 continues, we are certainly living in interesting times. To top this off the first of the Blood Moons is due in 3 weeks, on Passover, April 14, 15. This Blood Moon will be the first in an unusual Tetrad of Blood Moons falling on Feast days in 2014 and 2015. In the Bible the books of Joel, Acts and Revelations talk of the Blood moons as one of the signs of the Day of the Lord. Could these signs be pointing to something significant for us? David – or Davo as his mates called him – was over the moon. After years of patiently developing his business, his business ideas had caught the eye of the prominent Chinese business leader Mr. Wang. Mr Wang had announced that he was going to make a special trip to Australia to see David and find out more – and they had excitedly arranged to meet at the airport. We all have an important appointment coming up with THE Mr. Wang Himself – Jesus our Lord and King (Wang means ‘king’ in Chinese). He is indeed coming soon! But to be ready for this once-in-a-lifetime divine appointment, we need to make sure that we too are on the King’s calendar. The word translated ‘feast’ here, does not really refer to parties, food and celebrations – although God does indeed through some great celebrations. The Hebrew word for ‘Feast’ is actually better translated as ‘appointment’ – a ‘divine appointment’. Note that God describes them as ‘My feasts’. They are not some antiquated Jewish customs to be brushed aside – they are His Divine appointments with us. How close are we to the last 3 Divine Appointments? Will we see them in our lifetime? There are many things happening in our world that we should watch – including significant developments concerning Israel, the Nations, and concerning the great harvest of people coming into the Kingdom from every tribe, tongue and kingdom! All this points us to the fact that we are living in a time where Bible prophecy is being fulfilled at a scale that has not been seen in history since the time of the Book of Acts. I believe we are indeed getting closer to the Lord’s return! The most literal way of interpreting this is that there will be solar and lunar eclipses around the time of the Lord’s return. A few years ago, a Messianic Pastor called Mark Biltz made a startling discovery of a pattern where from time to time 4 consecutive lunar eclipses take place – precisely on the first and last ‘appointments’ or Feasts of the Lord for 2 years in a row. This is an extremely rare event, and what is even more interesting is that it appears to happen at times when there are prophetically significant events taking place on the earth. Around the time of Jesus death there were 4 partial lunar eclipses in a row on the ‘Divine Appointments’ – as if God Himself was signalling to all of mankind the importance of this event! As we enter into 2014/2015 it is therefore important to watch and pray for Jews and Christians, for Israel and for the Islamic World. 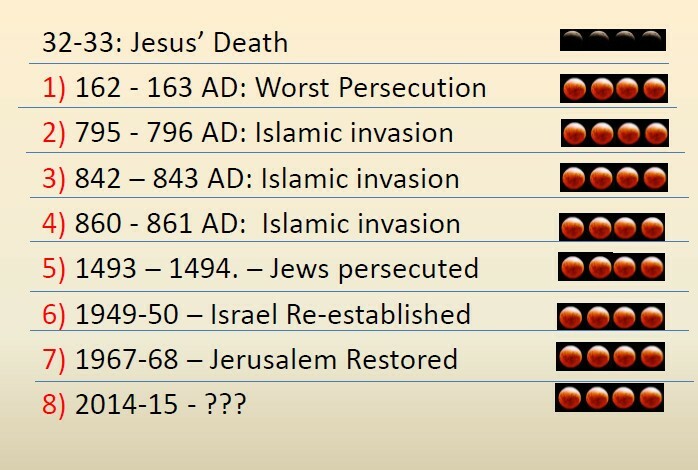 Returning to the pattern, it is extra interesting to note that the 7th lunar eclipse cycle happened at exactly the time when Jerusalem was being recaptured by Israel – and 7 is the number of ‘completion’. It was truly a time of Divine completion of ancient prophecies! The next time this will happen will be in 2014 and 2015! Ok – sounds interesting – now what? As a Church, we are being encouraged to fast, pray and spend extra time to seek the Lord at this time. Make sure your own life is in order with God. If you are struggling with issues, take them to the Lord and maybe get one of the leaders to stand with you in prayer that you might be able to live fully for the Lord. Also, please pray for Israel and the Middle East at this time – her sworn enemies would like nothing less than the extermination of Israel and hope and dream for that day to come. Iran seeks to clandestinely build nuclear weapons and recently released a video proudly showing them launching a nuclear strike. At the same time other terrorist networks are seeking biological and chemical weapons to add to their arsenals. Daily anti-Semitic propaganda is being published across the Middle East, and the level of general hatred for the Jews is comparable to the situation in Germany at the time when Hitler came to power. So, let’s fast a meal when we can and spend extra time to seek God at this crucial time in history. We are called to be history-makers and we have a role in interceding for God’s will to be done on earth as it is in Heaven. Enoch Lavender has a B.A. in Intercultural Ministry from Harvest Bible College (2008) and was a youth leader for 3 years in ECCC – Eastern Chinese Christian Church. Enoch is actively involved in a range of ministries including Shalom Israel, Ebenezer Emergency Fund and Teach All Nations (Dr. Kameel Majdali). Categories: Bible Prophecy, Current Events | Tags: 2014, Blood moons, Crimea, current events, Feasts, Hebrew roots, israel, MH370, missing plane, passover, Russia, tetrad, war | Permalink.